There are many reasons I like Jasper Fforde’s writing, but one of the main reasons I do is that Fforde has the rare talent of taking fundamentally farcical plot concepts (People enter books! Detectives solve crimes in a nursery rhyme world!) and paying them off in ways that are not, in fact, merely farcical. So while Fforde’s books are delightfully loopy and funny, they aren’t constructed in a knockabout, we’re-just-in-it-for-a-lark way. There’s a there there, isn’t there. And that’s harder than it looks. Fforde’s at it again in Shades of Grey, a book which posits a future in which what you see, chromatically speaking, in a large part defines who you are. A wild idea — a big idea, even — but as you’ll see (although not necessarily chromatically), when Fforde sets to writing, the obvious consequences of such a world aren’t necessarily the first or biggest thing on his mind, when it to comes to constructing his story. My Big Idea was not to use the Big Idea. Chuck it out, stuff it in the corner and relegate the obvious thread to the ignominy of subplot status. Then have the Small Idea advanced undeservedly to prominence. So my post-apocalyptic book has the nature of the ‘Something that Happened’ not only unanswered, but largely ignored. The remnants of the advanced technology that litter the landscape remain tantalisingly unexplored. All that remains of the Previous – mostly teeth, by now, complete with fillings – are simply trod underfoot. Anarchy is an alien concept; the world is ordered, neat, and static. The questions that dominate my character’s lives range from how they can marry into the Oxblood family’s String empire, the need to conduct a chair census, the visit to the Last Rabbit, the vexing question of where all the spoons went and, most important of all, how one can avoid the cold spectre of social embarrassment in a world obsessed with politeness and order? I have twelve or so ‘Writing Rules’ and sandwiched between number Seven: ‘Never use the word Majestic’ and number Nine: ‘On the hoof flexibility’ I have: ‘Always favour the less well trodden path’. An obvious adage, perhaps, but given the lamentable sameness of many novels, one that should be lifted to greater prominence. The theory is simple. You are walking in a metaphorical forest, chewing your metaphorical pencil and making narrative decisions, when you are presented with two paths – a well-worn route to safe, broadly-lit upland literary pastures, and a less-used one – a route towards experimentation, speculation, and risk. So I chose my idea – Post Apocalyptic Dystopia – and then noted the well trodden path: The immediate aftermath of a global upheaval. The population in disarray, citizens fighting for survival in a new world order. Too obvious. How about seven hundred years afterwards, when the fall of mankind has no more relevance than the Dark Ages has to us today? I don’t know about you, but I rarely talk about Edward III’s scandalous claim to the French throne in 1337, but it’s all people talked about then. So we’re seven hundred years on and – several less well trodden paths later – we’re not talking about survival but simply getting through the day. A day in a different yet recognisable society based on different values and rules – visual colour in this case, where everything from social mobility, aspiration, health and commerce are based around colour. Earn enough and you can afford colorised bananas for dinner. More expensive, but it impresses the neighbours. The strict social hierarchy is decided not on something so hideously old fashioned as choice, intellect or the ability to lie convincingly to electors, but simply the colour you can see. If you are born able to see Purple you’re at the top of the stack; If you are born without any colour vision at all, then you’re at the bottom. Unquestionably objective. These are the sort of less well trodden paths I like. Because once you’re seven or ten less-well trodden paths from that first, the path has become so faint that you might not actually be on a path at all. And if you are now walking through that virgin forest of originality, then you have strayed well. But it’s not enough to think up a new idea. It has to work. And that’s another less well trodden path all on its own. Landscape is one thing, characterisation and plotting quite another. And this is what I enjoy about the sort of writing I’m attempting in Shades of Grey – to try and give the mundane a narrative force all of its own. Two guys in a room and one of them has a gun? To me, that’s just plain lazy. Two guys in a room and one of them has lied about whether he has seen the last rabbit or not? And this one lie is enough to have someone ostracised by society and a need to prove themselves as redemption? Now that’s drama, and what’s more, it’s unconventional drama. The reader is always looking for something new and fresh and interesting, and since all the stories have pretty much been written, the bold frontier for authors these days is to further the technique of how they can be told – with different settings, different characters, different times – and for me, different values. In case you’re wondering, we DO find out where all the spoons went, and you can learn how a tree goes Purple, and why the Green Room is better than the Mildew. You may even learn why nobody comes back from High Saffron, why there is a Caravaggio in the Greyzone and what Jane put in the Prefect’s scones. It’s narrative drive, but not as we usually know it. For me, the best Big Idea is the sneaky Small Idea that overtakes you on the inside when you’re not watching. Read an excerpt of the novel. Visit the Shades of Grey Web site. Follow Jasper Fforde on Twitter. I’m afraid the title has been ruined forever for me by Andrew Burt. i was actually on twitter when i saw @blogwhatever’s announcement about jasper fforde being “the big idea”. he’s so cool and clever. the nursery crime series got me hooked on his work and then i started reading thursday next’s adventures. now i have signed copies of everything. he so rocks. I’ll second turtlesong’s recommendation. Jasper does rock. He has the amazing ability to be both clever and good, and he also has a penchant for doing things like using a whole novel to set up a particularly bad pun, which takes the whole pun thing to a new level in my opinion. I had a chance to start on this book already. So far it is excellent. I truely look forward to finding out what Jane put in the scones. Thanks for featuring this author and this book. When I saw Jasper’s Fforde’s name in the header, I actually momentarily went all fangirl (squee! ZOMG!) I love his books. I can hardly wait to get my hands on this one. Thanks for all the hard work, from both of you. I also read “agent to the stars” this weekend, cover to cover in 3.5 hours and enjoyed it so much I keep shoving my copy in my family’s faces and telling them to read it. They think I”m weird. I do seem to have been born to see purple. Alas, I am also a bit color blind. *Love* Jasper Fforde. Read all four of his original Thursday Next novels. 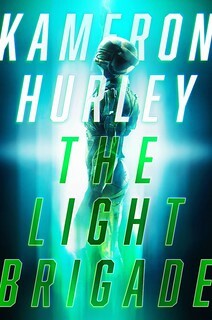 Am looking forward to the fifth (Thursday Next: First Among Sequels), and this one sounds fascinating. The color thing is a neat angle. I loved Brandon Sanderson’s Warbreaker, which also takes a neat swing at the elevated use of color in a society. Johne, I’m not sure where I’d classify it either … the Thursday Next series always struck me as a different twist on “alternative history”, but science and technology are somewhat integral to the stories, so “science fiction” doesn’t seem to be a bad description either. If you’re asked about the book, you’ll probably want to tailor the category to the audience! While I’m as guilty as anyone of wanting to share with things I love with only those who deserve it, I’m delighted to see Jasper Fforde here. I’d always assumed that the sheer number of puns and the local audience for some of them (Leigh Delamere anyone?) would make him a fairly limited treat. 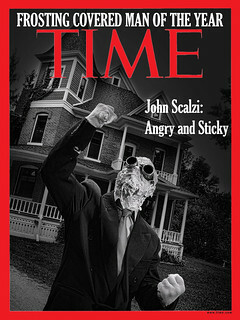 So, hurrah for Mr Scalzi for spreading the news. We are Fforde fans in this house, too. But you have to be, after the Richard III in The Eyre Affair makes you giggle so loud and long on a peak hour train that you end up reading it to half the carriage. Oh, the meme was spread that day, I can tell you – I’ve heard complete strangers asking each other when the summer of their discontent was, panto-style. It’s a book I give to those who are all superior about Not Reading Science Fiction – I let them read it and rave to me about it, and buy the sequelae, and then I point out that the reason there are mammoths is because Germany won the War, and watch their brains freeze. I stick to “bloody good,” and try to avoid the same old same old but I don’t real juvenile trash like… crap. Wouldn’t be too sure of that. Terry Pratchet’s Discworld books are full of puns (quite a few of them so bad they’re wonderful) and fairly obscure references to English pop culture, history and politics and they don’t seem to have done him any harm in foreign parts. Fforde is so articulate it’s almost…majestic. No mention of toast? ;-) I have a signed copy of the Eyre Affair, along with the Eat More Toast stamp, and that was only the first in a line of fun books. This is off-topic, but on the subject of toast, ask another genius, Haywood Banks, about toast, and you’ll get a brilliant song played on toaster with two spoons. But… that’s the name of an SG-1 episode! I was delighted to discover Fforde’s book and have devored and then eagerly waited for the next. I was a little reticent about the new one, but after reading comments I am intrigued enough to purchasse and delve once again into Fforde world.